Confusing Drum Workshop tie-in aside, DW Drum Enhancer is an intuitive and broadly effective mixing tool for drums. Very tasty saturation and distortion. Not enough control for deep tweaking. Created in collaboration with Drum Workshop, manufacturer of arguably the finest drums in the world, Audified’s latest is a multieffects processor that combines gating, compression, EQ and tube-style saturation in a single plugin (VST/AU/AAX), tuned explicitly for the processing of multitrack drums and drum buses. Anyway, with DW Drum Enhancer loaded onto every channel of your drum kit mix, or just the group bus, you’ll generally want to start with a setup from the drum/task-specific preset menus. These are categorised ‘Bus’, ‘Kick’, ‘Snare’, ‘OH’, ‘Room’, etc, and each category contains a good range of descriptively-named presets. The naming of certain entries as ‘DW’ presets is a bit meaningless, though. Apparently they were created by processing DW drums, but that obviously has no bearing whatsoever on the sonic outcome, as that depends entirely on the drums you’re treating. When it comes to dialling in your own settings, the first thing to do is choose one of the three options within the Snare, Kick, Toms or Other quadrant of the Drum Type selector. For the first three, these are Modern, Heavy and Vintage, while the Others are Room, OH (overheads) and Bus. Your selection here has a profound impact on the sound of the plugin, reconfiguring the inner workings of the four processing blocks - see All change below. At the heart of DW Drum Enhancer, the Drum Type selector tailors the Gate, Compressor and EQ modules to the specific drum and sonic style - or ‘Other’ signal (Room, OH or Bus) - chosen from among its 12 circularly arranged options. For Gate, the parameters governed are attack and release times. Compressor’s attack and release are also established entirely by the Drum Type, as are the shape of its knee, the sidechain filter frequency and the style of compression applied, with the Heavy and Vintage settings deploying “two popular transistor” models, and Modern using a “pure digital” one. With EQ only enabling hands-on control of gain and filter on/off via the front panel, it’s left to the Drum Type to determine not only the centre frequency of each parametric band and the cutoff frequencies of both filters, but also the shape and steepness of the roll-off slopes. The first block in the chain is the noise Gate, featuring a Threshold knob and a choice of Hard or Soft knee. Next comes either Compressor or EQ, depending on the status of the EQ Position switch. 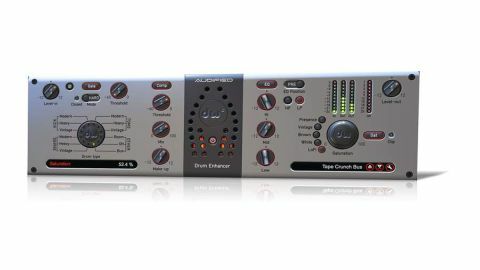 Compressor gives access to Threshold, Mix (for parallel compression) and Make-up gain, while EQ simply offers gain knobs (up to +/-12dB) for its Hi, Mid and Low bands, and on/off switches for LP and HP filters. At the end of the chain, the Saturation knob applies valve-emulating distortion to the output. Five Saturation algorithms are available, between them presenting a wide range of harmonic-enhancing flavours, all with an authentically analogue sound. While the four modules sound great - particularly Saturation - the inability to tweak attack/release times and EQ frequencies is a hindrance. Indeed, this is an inevitable issue with any ‘boiled-down’ system that merges and conceals complex parameters under the hood in the interest of maximising operational simplicity; and although DW Drum Enhancer strikes a good balance, by and large, the lack of precision can become an issue. DW Drum Enhancer probably won’t replace your established drum mixing chains, but for getting quality results with a minimum of user input, it’s largely successful. And being so quick and easy to use, it’s an empowering plugin that mixing novices should certainly check out.